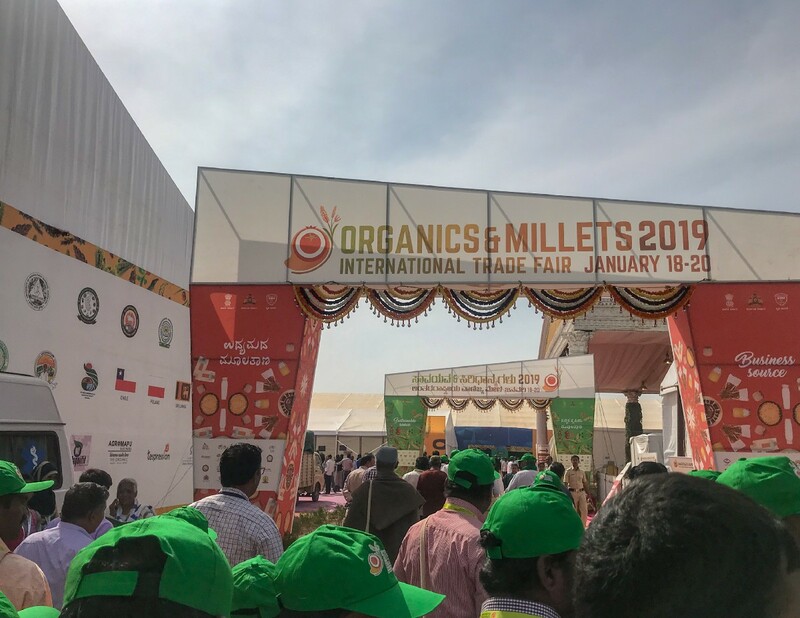 My flight to Bangalore arrived on January 16, 2019, just in time for the ‘Organic & Millets 2019 — International Trade Fair,’ held in the city from January 18th -20th at the Bengaluru Palace. 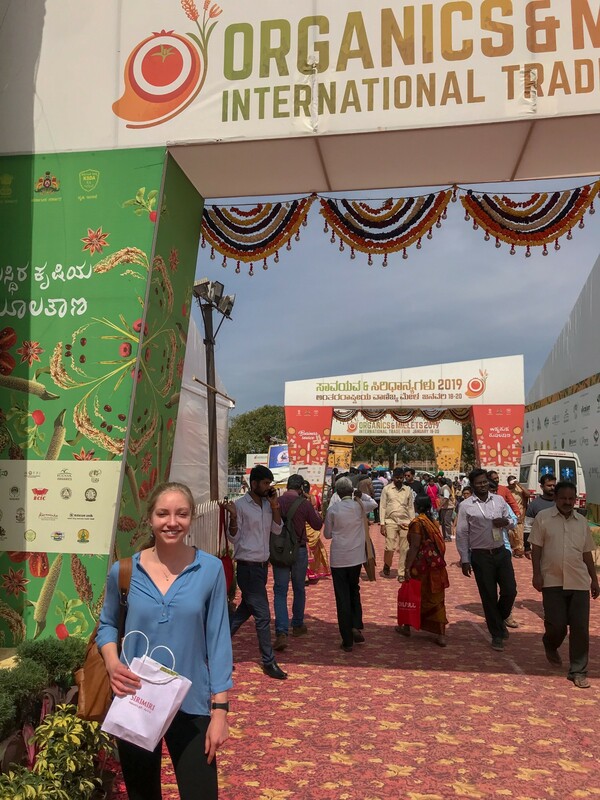 Just as it has for the past two years, the State of Karnataka erected an enormous covered tent on the palace grounds, filled with close to 300 colorful stalls displaying baskets of various organic and millet produce, labeled in their English and local Indian language names. This three-day annual fair was organized by Karnataka’s Department of Agriculture and is the third of its kind since its inauguration in 2017. The fair was a tremendous, at times overwhelming, feast for the senses. Herded along with the throngs of people on that first day, my colleague and I entered through a 20-ft tall archway and were met by colorful Rangolis, traditional south-Indian patterned floor artwork, created out of all the varieties of millets. Young men and women dressed as Millet Maga and Millet Magalu, mascots from the state government’s campaign for millets, stood at the entrance gates, outfitted in red capes and face paint. I entered into the first tent and began the felt red-carpet walk through the stalls. The space was loud and echoed with conversations about ragi (finger millet), jowar (sorghum), bajra (pearl millet), and navane (foxtail millet). Even with my generally good sense of direction, I quickly lost my place in the airplane-hangar sized exhibition area. This millet mela, as the name implies, was filled with as many millet devotees as a Hindu festival. It was a maze of millet cookies and displays, each stall boasting its own collection of bowls to sample from. I had never seen so many millet products — biscuits, muesli, bars, puffed snacks, baby food, protein shakes, baked goods, and instant mixes. I was glad to have eaten a light breakfast, for the obligatory sampling was a full meal in itself. The range in organizations was vast — everyone from grocery-shelf regulars like Soulfull to unknown farmer collectives, to start-ups displaying their cutting-edge hulling machinery. Wide-eyed visitors flocked to an exhibit boasting colorful marketing materials and smiling salespeople handing out pamphlets, while just beside it stood an unadorned stall staffed by farmers sitting on the ground chatting in Kannada. This lackadaisical group had only a slapdash poster pinned to the back of their tent and bags of raw millets sparsely laid out on a plastic table. The wide variety in millet representatives demonstrated the range in stakeholders involved. 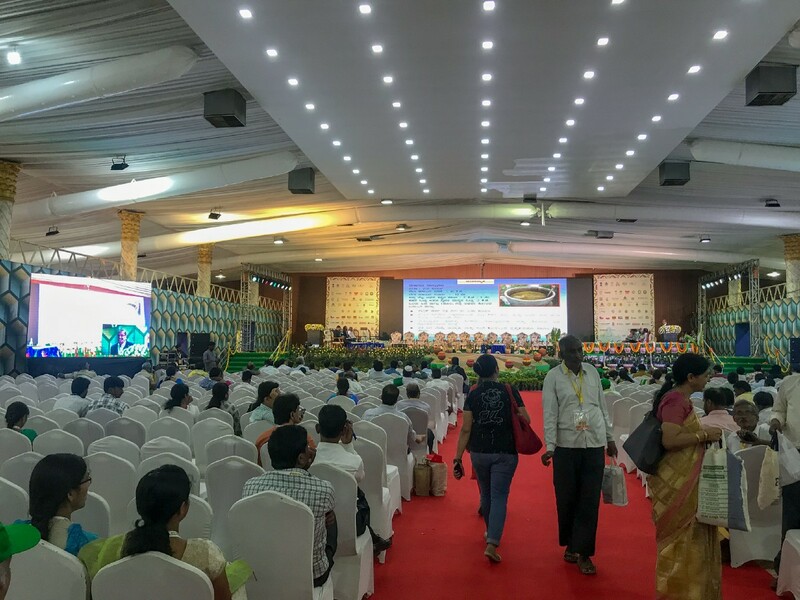 Beyond the exhibition stalls, the trade fair included panels with renowned ministry speakers, B2B networking events, farmer training workshops, live cooking demos, and inspiring keynote speeches by government research organizations. You may be wondering, as I was, “What is the big deal about millets?” Or, if you live in India, you may have already caught on to the fad. Millets are those brown or yellow-colored grains you may have seen in health-food stores. This course grain comes in about seven main varieties, each having their own unique nutritional profiles. 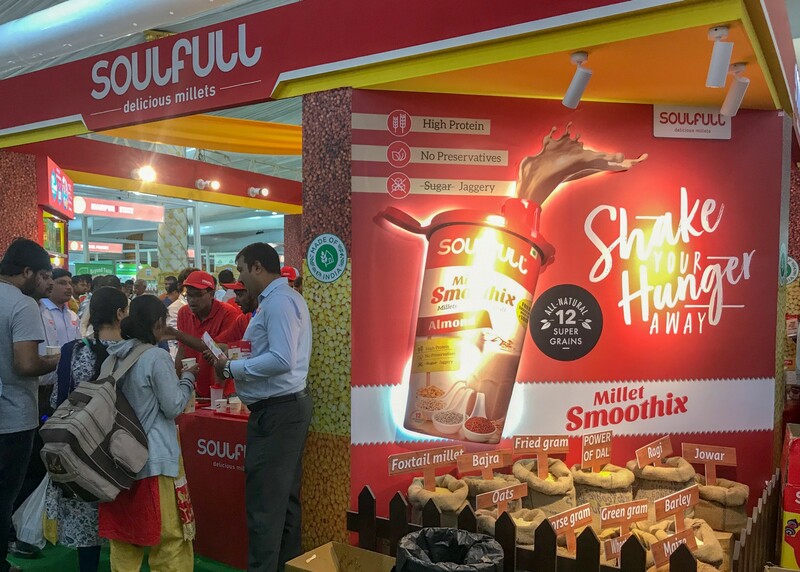 As this extravagant trade fair demonstrates, these inauspicious granules seemed to have captured, or more precisely, “re-captured,” the heart of India. Let me explain. Millets are some of the most ancient grains first domesticated in Africa and South Asia. In fact, the earliest known archaeological finding of finger millet in India dates back to the second millennia BC. These small-seeded, nutrient-rich cereals grow well in semiarid, hot regions with rocky soils, characteristics that made them a staple crop across the globe for thousands of years. Since the 1960s, however, millets have all but disappeared from mainstream diets. A report by the Karnataka State Department of Agriculture documents the drastic reduction of land acreage for millet cultivation in the last fifty years. From 1960 to 2016, cultivation for small millets in particular reduced by 70%. 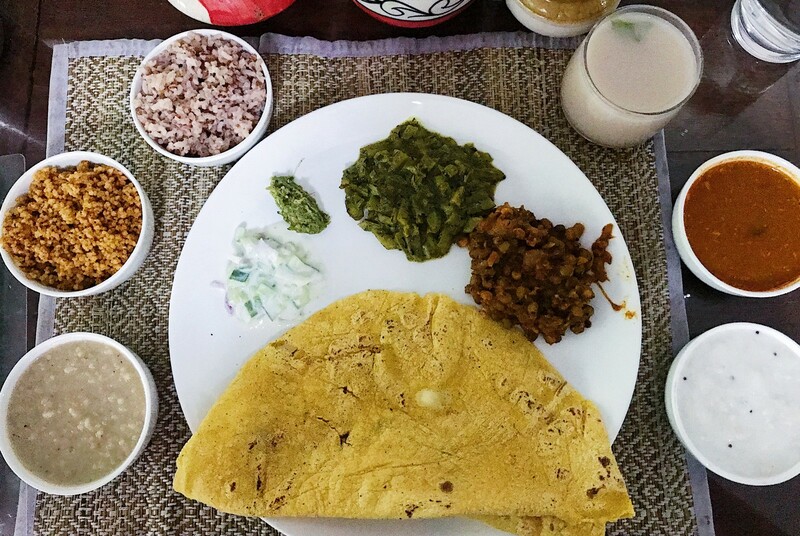 In an interview with the Economic Times, former Prime Minister Gowda called ragi (finger millet) and jowar (sorghum) are part of the basic identity of the south and north Karnataka, respectively. Yet declining production has questioned that deeply rooted identity. Jowar production fell by almost two thirds, from 29.69 lakh hectares in 1960–1961 to 10.95 lakh hectares in 2015–2016. The Green Revolution represented a transfer in technology and knowledge. Traditional agriculture was replaced by new technologies. Subsistence farming, the dominant lifestyle for thousands of years in which farmers grow a diverse range of crops primarily to feed their own families or to trade with their neighbors, gave way to an export-based market economy. All in the span of two decades, the gap between rural and urban areas radically diminished (as farmers engaged more in markets), and so too did the diversity of crops. Across the globe, the Green Revolution was viewed as a huge leap forward. In India, the most promising agricultural areas having access to resources and high irrigation potential were selected as part of the Intensive Agricultural Areas Program (IAAP) and the High Yielding Varieties Program (HYVP). The aggressive cultivation methods coupled with access to credit and marketing facilities led to quick and dramatic productivity increases writes researcher Parayil in the Journal of Technology and Culture. The states of Punjab and Haryana experienced two to three-fold yield increases in rice and wheat. This massive boom in the 1960s could not have come at a more opportune time for India, as the country was on the brink of famine after fifteen years of rapid industrialization at the expense of agriculture. The agricultural changes allowed India to become self-sufficient in food grain, no longer relying on direct food aid from the West. With this newfound food security and economy came changes in diet, culture, and a clear ideological shift towards a technology-driven, scientific mindset. This shift was made possible through the massive political campaigns, international partnerships between governments, donor agencies, and research institutions, and universal recognition that science and technology is the path to the future. 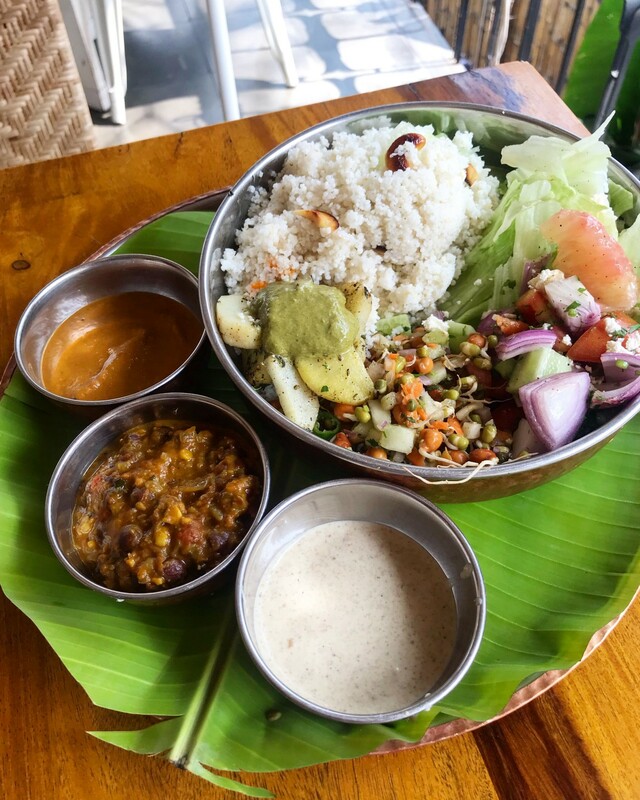 Millet Buddha Bowl at “Go Native” in Jayanagar, Bangalore. Despite the massive production boom, many regions and populations were excluded. The selective IAAP program exacerbated regional disparities in economic production and favored large farmers who could take on the substantial investments required for inputs. The vast majority of Indian farmers, most growing on small and marginal plots, did not experience the sweep of the revolution. Furthermore, those farmers that were included did not fare so well down the line in terms of their own health and that of their soil. The complex, economic, political, and social outcomes make the Green Revolution an extremely contested debate today. Now, just over fifty years later, India and our entire planet are facing the unintended consequences of the Green Revolution. While the Green Revolution’s “miracle” crop varieties did massively boost food production, it was a solution that put us one step forward and three steps back. In an interview, Oliver King, a Ph.D. researcher from the M.S. Swaminathan Research Foundation, captured the ambiguous Indian attitude towards the Green Revolution well — ‘It was a ‘time-solution’ — a solution for the crisis at that time.” The immediate goal was food production for the masses, which it did, skyrocketing yield and plummeting price for rice and wheat. Yet all the while Indian granaries were overflowing, the revolution’s promise to end hunger for all and increase small farmers’ income was not realized. The heavy adoption of inputs like chemical fertilizers and pesticides made it so the small and marginal cultivators could not afford to buy their own products and were unable to keep up with the agri-business giants dominating the commodity industry. The switch to monoculture, export farming made farmers completely dependent on the market, as they could no longer be self-sufficient from their land. Furthermore, fifty years of intensive monoculture farming reliant on chemicals has ravaged soil health. Combined with the increasing effects of climate change, yields have, to the horror of faithful Green Revolution-proponents, also plummeted. Although the Green Revolution was originally seen as a way of helping farmers, it has instead contributed to a vicious cycle of debt that has resulted in thousands of farmer suicides. Now, faced with thousands of debt-laden and desperate farmers, depleted soils, and urban populations facing nutrition-related chronic illness, India has started a new movement with a new mission. Front and center stage is millet. Millet thali at Vaathsalya Millet Cafe in JP Nagar, Bangalore. Dubbed a “smart food” by the International Crops Research Institute for the Semi-Arid Tropics (ICRISAT), millet symbolizes their health crusade on three fronts –health of the planet, health of consumers, and health of farmers. There are a number of reasons why millets have emerged as the 2.0 “miracle crops.” First of all, these naturally drought-resilient crops require 2.5 times less water than rice and can tolerate high temperatures and low levels of fertilizer. Fewer inputs mean cost savings and low barriers for small and marginal farmers. Furthermore, millets can grow in almost any type of soil, recover quickly from weather-related stresses, and have a capacity for carbon sequestration. These natural characteristics make them more resilient to the effects of climate change currently taking a large toll on agriculture, such as droughts, heat waves, and flash floods. In addition to their ecological and economic benefits, millets contain more fiber, protein, and micronutrients than rice or wheat. Because of their low glycemic index, the introduction of millets into mainstream diets is also one method of addressing the increasingly urgent levels of type 2 diabetes, malnutrition and obesity on the rise across India as processed fast-food options are more readily available in urban centers. Because of these recognized nutritional, resource efficiency, cost, and climate benefits, millets have suddenly become the focus of newspaper headlines and, as I personally witnessed, enormous trade fairs. The popularity of millets is no mysterious phenomenon. The spike in market demand is the result of aggressive promotion by international and government research institutions like ICRISAT and IIMR (Indian Institute of Millet Research). As agriculture is a state-controlled domain in India, the promotion of millets varies by region. Thanks in large part to the state of Karnataka which is leading the promotional campaign, though, millets have taken hold nationally. Beyond the media campaigns, the state has promoted millets through policy as well. The state’s chief minister HD Kumaraswamy announced in 2019 a new scheme to offer farmers 10,000 rupees directly into their bank accounts for each hectare of small millets grown. This package, called Raithi Siri, is the part of the state’s goal to expand millet to 10,000 hectares. India’s central government included millets in its food distribution programs for the first time in the 2013 National Food Security Act, but Karnataka’s program offers an even higher procurement price than the Minimum Support Price (MSP) announced seven years prior (M. S. Swaminathan Institute 2019). By Sunday, the last day of the Organics and Millets Trade Fair, my bag was overflowing with business cards of innovative millet start-ups, representatives from millet promoting institutions, and small farmer collectives — and of course, two boxes of delicious millet laddu made with ragi, jaggery, and ghee from the Timbaktu collective. Could Millet Go Too Far? The danger in building a movement around a single grain, granted one that has over a dozen types, each with a handful of sub-varieties, is that it verges on applying the same template as the Green Revolution. It doesn’t take a genius to rationalize that applying the same process will result in the same outcome. Using one cookie cutter, regardless of the ingredients of the recipe, will result in the same shape. Many farmers in India never stopped cultivating millet, but they grew it along with a variety of other crops. With the spike in urban demand, mission-driven NGOs are encouraging small and marginal farmers to shift more of their production to millet, to sell to the market. Adithya B, a millet store and café owner in Bangalore looked at his near-empty shelves and told me, “The supply can’t keep up with the demand!” Like in the case of rice or wheat, encouraging mono-cultures of millet depletes the soil and makes subsistence impossible. Perhaps the urban consumers are getting healthier diets, but what about the farmers that can no longer afford their once-staple grain? Could millet fare the same fate as the now-controversial quinoa in the United States? The quinoa trade is a concerning example of how health and ethics-led consumers unintentionally jeopardized farmer food security by turning staple crops into premium export goods. Due to high western demand, many farmers in Peru and Bolivia who once relied on this staple grain, can no longer to eat it themselves. Stealing headlines as the high-protein “miracle grain of the Andes,” quinoa became the ethical choice for meat-avoiding, health-food store regulars in the US and Europe. As demand spiked, price followed, tripling since 2006. In Peru, quinoa became more expensive than chicken. Families for whom quinoa was part of their culinary history for generations are now turning to cheaper imported convenience food. This cautionary tale reminds us that there is no such thing as a “miracle crop.” Rather than viewing millet as a trifecta of benefits, perhaps it is more accurately three divergent forces that, when in excess, trade-off one for the two others. Higher nutrition for the urban masses may come at the cost of the soil health if increased production of one type of millet reduces overall crop diversity. Similarly, value-added millet products — shakes, snacks, and instant mixes — although bringing higher returns, trade-off nutrition as processing strips away the fibrous brans. Furthermore, leaving processing in the hands of the traditional supply-chain, with farmers selling their raw material to intermediaries, subverts the mission of increasing rural income. On the last point, King says the movement needs two main changes. First — “Leave some millets for the farmers!” and second, “Bring the tools to the farmers!” Millets need to be processed to be consumed, and in many rural areas, women spend hours preparing millets by hand (1.5–2 hours to process only 5kgs.) Simply buying millets from farmers will not help them — farmers need to have their own value-addition procedures themselves. Investments in bringing processing machinery to the farmers themselves are one direct way of doing that. With this technology, farmers can sell the surplus for extra cash, while keeping enough for themselves. Of course, getting the finance to invest in such technologies is another hurdle of its own. Investment in infrastructure and resources to ensure the smart-food balance is actually smart requires more than just market forces. Seated on a stool in his small organic food shop in Pulikeshi Nagar, Mulla said to me, “None of the stakeholders in the whole system have a holistic picture of food keeping environment, soil, farmers, and consumers in mind… the aggregators, distributors, and retailers like me only fulfill demand created by the consumer and somewhere individuals like Dr. Khader become the authority of what people should eat. This, in turn, dictates what farmers should grow.” These unchecked supply and demand forces are why public policy is also so important. Many state governments, with Karnataka leading the way, are doing more than just offering attractive procurement prices for millets. Karnataka’s agriculture department also set up a consortium with ICRISAT and four state agricultural universities to develop a genetic hybrid for higher-yielding varieties of millet. Increased productivity encourages more farmers to switch from cash crops like cotton and maize to millet, which has an overall net positive effect for the smart-balance equation. Where we have to be more careful though, is to not accidentally incentivize farmers to start monoculture, commodity farming of only one type of millet, like ragi which has more than doubled the demand in Bangalore than other millets. The good thing about the Green Revolution’s dismissal of dryland crops like millet is that its robust diversity has, luckily, survived to this day. Let’s not create a single, high-yielding millet variety (sound familiar? ), killing the rest in the name of doing good. With all these caveats and asterixis checking the overwhelmingly positive attitude surrounding the millet movement, I’m starting to become unsure how to feel about it. The similarities to the green revolution make me fearful. Increasing production lends itself to standardization, mechanization, and decreased diversity. I don’t want this well-intentioned movement to make the same mistakes of the past. Yet I am comforted by the knowledge that the vastly different context around millets from that of rice and wheat almost guarantees that the trajectory will be different. The formula of the green revolution worked for water-rich farmers. Irrigation was the critical ingredient. Those without it, the small and marginal farmers, were excluded. This exclusion, however, is precisely why millets survived. Millets are the domain of the small and marginal farmer, and so the model for growth will be based around their needs. Low input farming, crop rotation, regional soil differences, and cultural considerations must all be part of the discussion. I have hope that this millet movement, built on the foundation of small and marginal farming, will progress in a way that goes beyond ensuring the three-fold smart balance. I have hope that it will also promote community-led innovation, valuation of indigenous agricultural knowledge, cultural sensitivity, joining together different stakeholders for the cause of our planet. The views expressed in this article are those personally of the author and do not necessarily reflect the opinion of the organization.